I know I've been absent for the past few weeks. I missed out on the tour of the Houdini House in NYC. I guess it's the curse of being a performer, and a busy one at that. I don't quite have the amount of time I'd like to do some other things, like explore Houdini's home. I have been hip deep in shows. But when I'm not out performing I seem to be engrossed in the world of Doug Henning. I'm not exactly sure what started this, maybe it was the new DougHenningProject blog. But I've been watching tons of clips of Henning that I have on old tapes. I've watched most of the old specials. I've purchased some posters and am rereading the excellent book by John Harrison. interest in magic. As I look back over my own career I see Henning's influence in much of the material I perform. The Needle Through Mirror still figures prominently in my show, and was featured by Henning on one of his specials. Twilight, a trick by Paul Harris was featured on that same special and was something I did early one and recently relearned it. The Vanishing Nickel, which was the opening trick of Doug's first NBC special was also one of my first tricks. The seashell matrix was another routine that I was always fond of and recently recorded it for my WeeklyWizardry show on Facebook. In my big show we present his Ring in Bread routine which he featured in his last tour and was the creation of Jim Steinmeyer. Another routine that Doug did was Joe Riding's 3 Card Trick with 4 Cards, which again, I have in my show, but with a very different presentation. The Rubic's Cube trick from his Broadway Special is yet another one! Gosh, there were more than I realized. 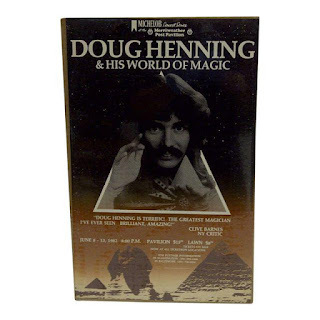 What can I say, Doug Henning had an eye for great magic. And of course he had a top notch team of advisors finding that magic for him! Watching Henning on talk shows is a delight. He excelled in those circumstances. Seeing him LIVE was even better. I was fortunate enough to see his show live 4 times. He always seemed genuine on stage. You never got the impression he was putting on an act, but rather, the guy you saw on-stage was probably very much like his off-stage persona as well. The one negative thing I will say is the writing on his specials was dreadful. I remember back in the day thinking it was dreadful and it's worse now, lol. But the magic was rock solid. I have a feeling more Henning magic will be in my shows in the future. After receiving the gift of one of Henning's canes from his Cane Cabinet, I've been giving that illusion serious thought. There are also two illusions that Henning did that I've never seen anyone else do that I think would be wonderful. In fact, I've always thought it would be a great fit for my show. I'll reserve the right to keep the name of it secret for now. But look at some of the illusions Henning did that others have done. Origami Box, yes Doug was the FIRST to present this beautiful illusion. Walking Through A Mirror, another first. The Water Levitation was pure Henning and the first to do it. The Elevator was a Doug Henning first, though his Elevator had a different method. And even though he wasn't the first to present The MisMade Lady and The Zig Zag Lady, they were certainly most associated with Doug Henning. 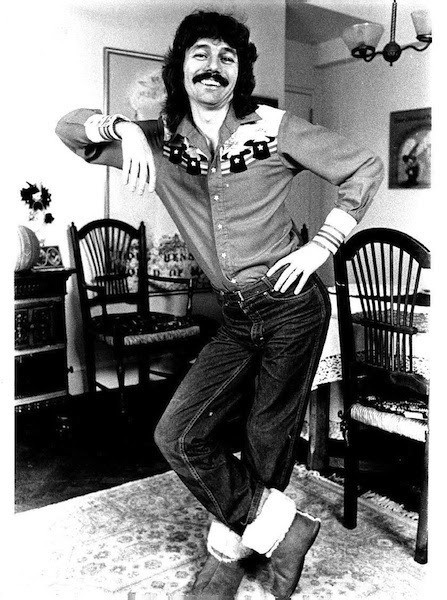 Where would we be today without Doug Henning? It's hard to say. He brought magic back to the masses and opened the door to future performers like David Copperfield and the countless others that followed him. Yes, it's true that Doug Henning was a product of his time and seems kind of goofy today. But I encourage you to look beyond the crazy costumes and corny jokes and experience the magic from a guy who truly believed there was real magic in the world! And please check out the DougHenningProject blog as it continues to have great content and interviews with folks who knew and worked with Doug Henning! Thanks for sharing that Whitt. I've talked to many people who said the same thing. I never got to meet him unfortunately. I still have the Doug Henning "Illusion or Reality" poster (as pictured above) displayed prominently in my bedroom ...I bought it after watching Doug Henning on his first or second tour.....years later I met him before a show at Taft Theatre in Dayton, Ohio ....he truly was just as nice offstage as on.....he also was my inspiration...truly the reason I have been a Professional Magician for 30 or more years ....Doug Henning will ALWAYS be missed.....in my mind he was the Greatest!